Just mentioning winter in Minnesota, a famous test of rigor, sends shudders into most folk who live in warmer and more temperate areas of the United States: our seasons are all dramatic. For the Pagans who live here, especially those in “Paganistan” (Minneapolis and St. Paul), the “Cross-Quarters” of the solar year take on a vividness rare to experience in more mild climates. 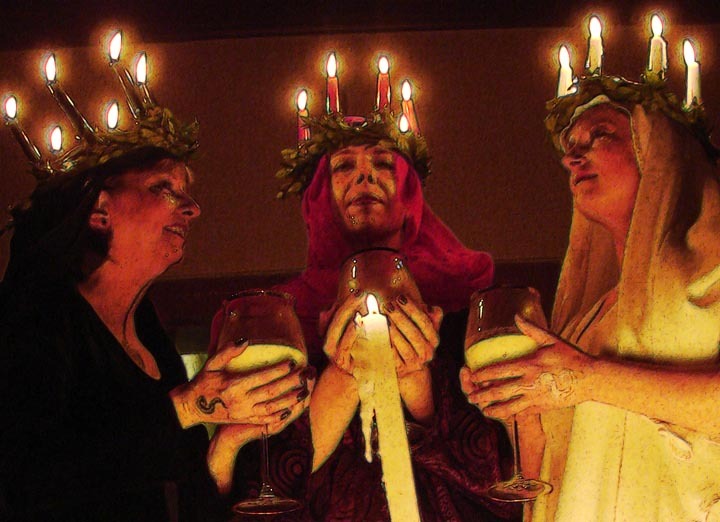 When the Festival of Brígid– Candlemas, Imbolc, or Oimelc— arrives at the beginning of February, we are more than ready for fire and warmth and spring! At Oimelc 1988, I was 19 and new to public ritual; I saw Fire, the Bride, come among us bearing a crown of light. 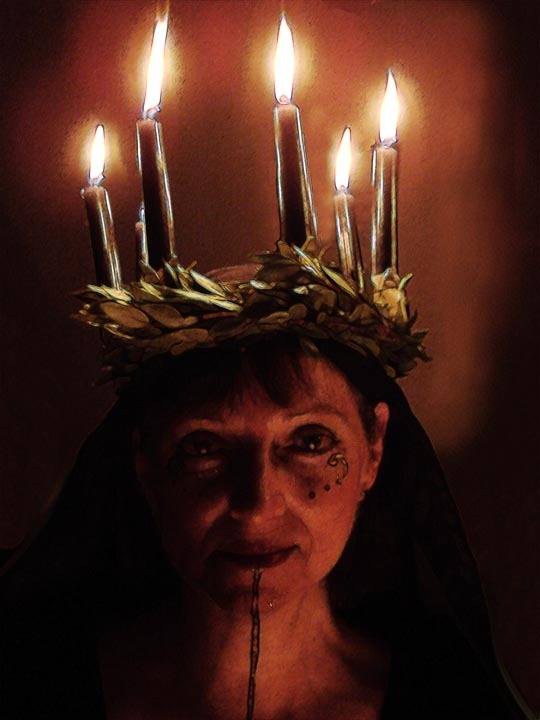 One woman alone, in a flowing gown, bringing light into the darkness; wholly taken by the spirit of the Goddess, who sang to us of Her love: Fire nurturing the people. 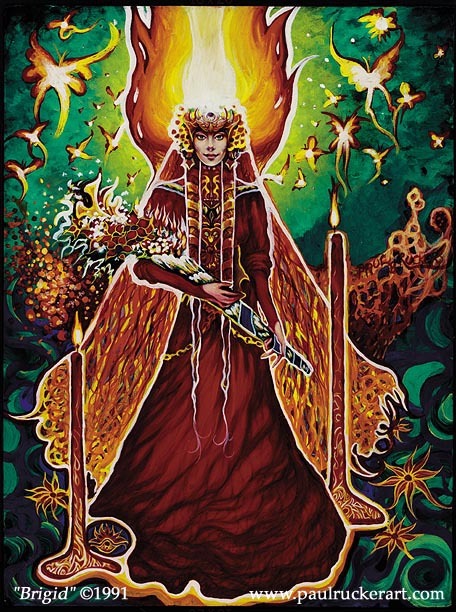 Divinely haunted, the next day I drew the essence of my impression of Her, which in turn evolved into a painting, one of my most popular early images– Brígid crowned with fire. 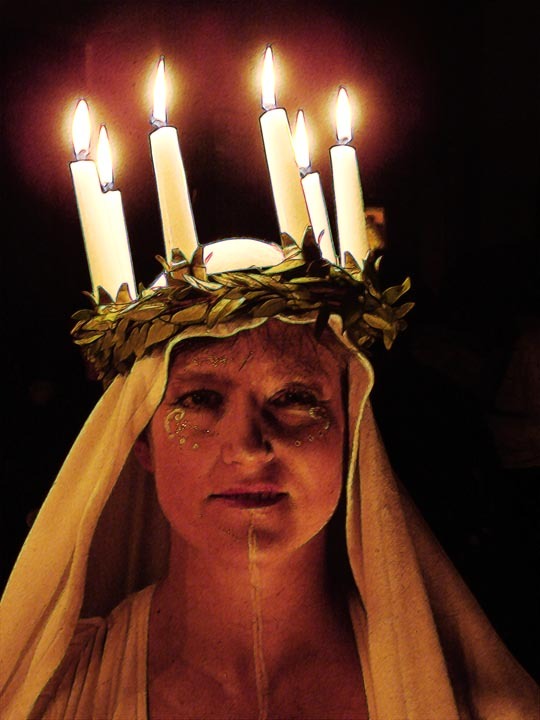 Whether Goddess or Saint, Brígid (or Brigit, Bríghde, Bríd, Bride, Brede), calls forth the love of the people as the emissary of light: Her time of year heralds the true beginning of Spring, though it seems like winter still. 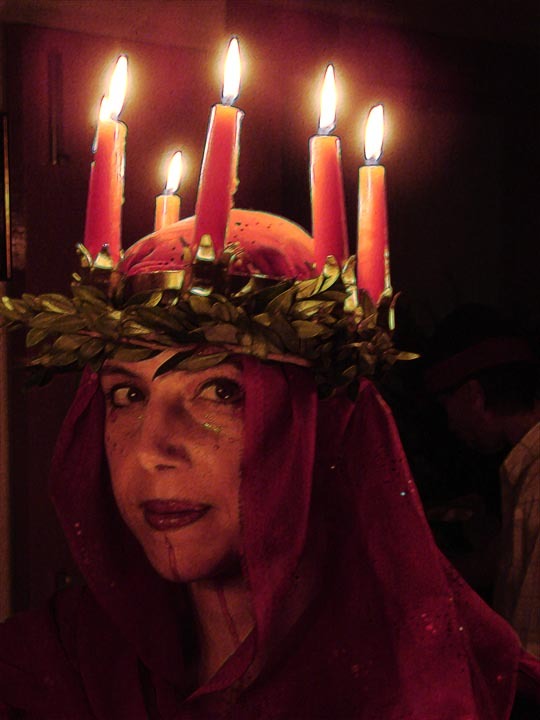 As Yule, the earlier winter holiday, is a Masculine Fire Festival, where the God of Light is himself reborn, and will show Himself as the Stag with Flames in His Tines, so Oimelc (“ewe’s milk”) is a Feminine Fire Festival, whose Lady arrives with inspiration, hope, creativity, fertility, purification, and beauty. When the ewes begin to give forth milk is also the time when the bees in the winter begin to swarm, getting ready for the Spring– milk and honey are brought forth. She is Fire in partnership with humans and all that we do with Brede’s fire within and without– crafting and smithing, healing, feeding, nurturing, protecting, and writing and speaking in poetry, is work done for others, for the people of our tribe. In a real sense, human community truly began when Fire became our partner. Hence, though the name Brede/Bride has no philological connection with the word “bride” as a wedding partner, for me there has been a rich felicity between these ideas. As guest ritualist 22 years later for this same community (NordCog, the local branch of the Covenant of the Goddess), I expanded this initial encounter so that our people met not one face of Brígid, or Brede, but three: White Brede for Healing and Nurturing, Red Brede for Crafting and Smithing, Black Brede for Inspiration and Poetry. Through the night we gave song back to Her, and light, and offerings of flowers. From Her came to us an abundance of milk and honey, and blessing. One of the great gifts of our Pagan tradition is that people of the community may at times have the honor of wearing the Aegis of the divinities of Nature briefly, for each other. We call this “aspecting,” “being mantled” by Divine Presence, “ridden” (as with the Haitian lwa) or, in the lineage of European Witchcraft, “Drawing Down (the Moon).” What can compare to seeing the God/dess before you, as real as yourself, and making an offering that is real to both of you? Words alone cannot touch this. From the experienced women of our community, I invited women of skills whose talents corresponded to the Brede that each embodied: janie, our White Brede is both a chef and a nurse; Anne, our Red Brede, is a painter and designer who also tattoos and make ceramics; Grace, our Black Brede, is a seamstress and a poet. For this rite I engaged the work of a smith to craft three identical candle crowns for the Three to wear. I wrapped myrtle branches around these crowns and set them with candles in each sacred color; also, I painted their faces in a symbol design that repeated the theme of Three— three dots on each cheek, three curving spirals, also in their colors. A critical role in this ritual came to the “Bredesman,” the principal male, played by Jack Green, who brought his experience in theater to memorizing a part with many lines. By tradition, the “man of the house” on Brede’s day in Ireland is the one who asks for permission for Brede to enter the house. 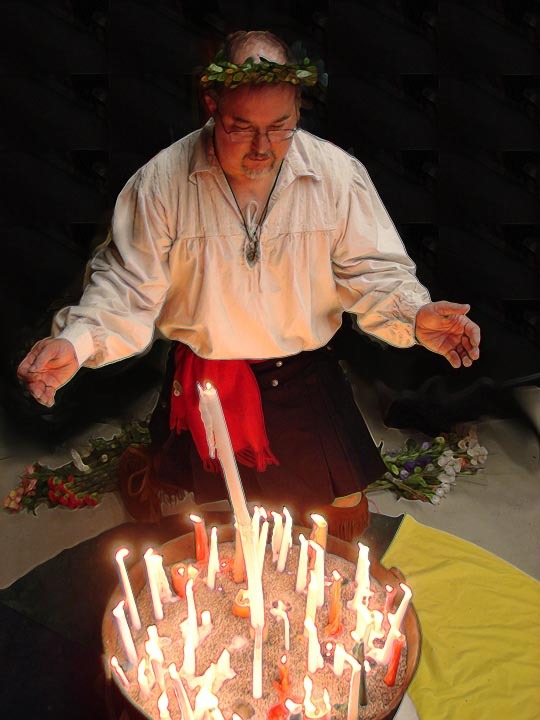 He blew out the flame– we began to chant “Brede is come, Brede is welcome” as the three Bredes came toward us, alight in the darkness, emerging from “the Mound” of the Otherworld (a room in back). The flames of their crowns circled their heads like warm stars, seeming to cast their rays into the farthest corners of our space. In their hands, each Brede held an identical glass chalice. The Bredes stopped at the edge of our community Cauldron and gestured for the Bredesman to light his taper from the center Brede’s crown. He took this new light to the people, and we lit our candles from this flame. Then he came before the Ladies again, placed his candle in the cauldron. Reverently he offered flowers to Brede, and received a libation of milk and honey. 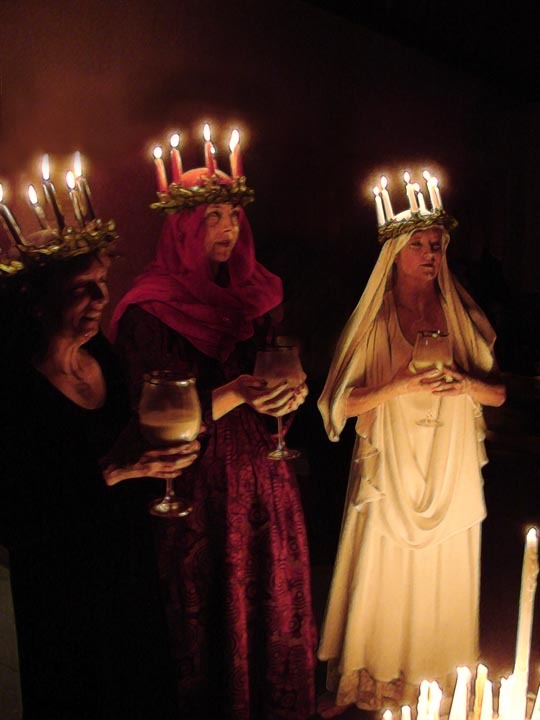 We began to sing “Taste the Milk, the Milk of the Mother– Drink from the Fountain, the Fountain, of Life” as the people spontaneously lined to meet the Ladies, who were joined by assistants we called Candlemaidens. This turned into an ecstatic song in itself, the eagerness of the people evident. “So there we were, maybe 75 or 80 of us standing in a crescent facing the Three Bredes. The time had come for us each to approach the Bredes, to lay our offerings at Their feet, and to receive Their nourishment and Their blessing. Standing on the very “horn” of the crescent, I was one of the first to approach Them: my job was to be a shill, an exemplar to the rest. I had anticipated that people would simply follow in line behind me, in nice, orderly, one-by-one Episcopalian fashion, as I’ve seen happen at ritual after ritual. But when I had received my blessing and stepped back to rejoin the crowd, I saw something else instead. No one wanted to wait in line. People were converging en masse from all over the room to approach the Bredes. Like golden spokes converging on a golden hub, people pressed forward together, trailing lines of fire, so enticing, so compelling, so centripetal was the Triple Vision before our eyes. Clearly, Brede’s fire had kindled in many of those present. “I/SHE saw glimpses of the growing season to come as the people came before me with tribute. To each: a taste of milk and honey. To many: blessings and fortunes told. When we came close to the end of the lines, community elder Stephanie Fox sang solo “Lady Lift Us Up– Where We Belong” which became the chant of our ecstatic dance before the Goddesses. One of my favorite memories is of watching the Bredes join hands and sway and undulate along with us as we danced, not to mention the sight of certain old-timers cutting loose. Drums articulated our energy flow; song and dance enfleshed a living body of worship. When the energy reached its peak, the Bredes raised their arms and the drumming died away. “By the White Fire of Healing– by the Red Fire of Making– by the Black Fire of Speaking– We bless you,” They said to us, before processing back to the Mound in the Otherworld. At that point Steven Posch, our Cantor, led us through a call and response of “Brede’s Breastplate”– a litany of Brede within and without and to all directions. Finally, our Bredesman brought the ritual to a close with words of thanksgiving, and the community Cauldron was allowed to continue burning until all of its candles had melted together– an unplanned, but meaningful coda. 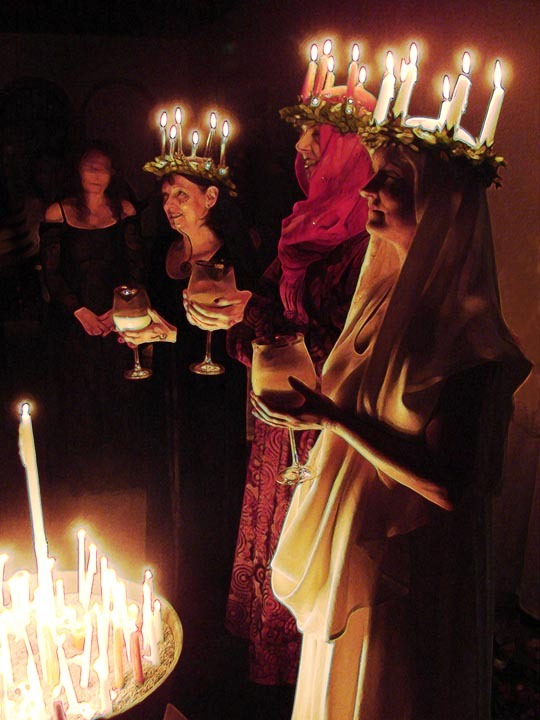 This rite was well received– it was an “old school” act of worship, harkening back twenty or more years before Paganism had become wholly respectable, and to the days before Moots and Meetups and the Internet, when the 4-times-yearly gatherings of this sort were THE place to join in communal Pagan thanksgiving and worship. A fine inauguration for a Year of Reborn Success, of past rites brought forth again.